Milkmaid Tea was created for those times when the "milk of momness" needs a little encouragement. Tasty iced or hot, USDA Certififed 100% Organic & Certified Kosher Milkmaid Tea is a fragrant and comforting blend of organic herbs traditionally used to help support healthy breast milk production. 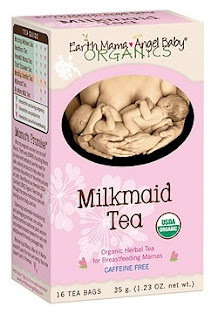 Blended with traditional herbal galactagogues, including fennel, fenugreek, anise seed and caraway seed, and mineral packed nettle and red raspberry leaf, Milkmaid Tea helps keep breast milk flowing from healthy mama to healthy baby. These herbs are not recommended during pregnancy in greater than culinary amounts. All Earth Mama Angel Baby teas now come in easy to brew tea bags! And there's even more good news: the tea bags are biodegradable, the tea overwrap is compostable and the 100% recycled and recyclable cartons were produced using wind energy. Steep, sip and enjoy! For an extra boost in breastmilk supply, drink 2-3 cups a day, iced or hot. Certified organic red raspberry leaf, stinging nettle, spearmint, alfalfa, fennel seed, fenugreek seed, orange peel, anise seed, caraway seed. salam.stock product ni masih ada lagi ke? "Jualan Penghabisan Stok Kain Sulam Bukit Tinggi"
Untuk keterangan lanjut, sila ke link ini "Kain Sulam Bukit Tinggi"
2. Do not copy @ make use of the photos. 3. Items that have been sold are not exchangeable, returnable or refundable. 4. Sold are in good condition. We are not responsible for any lost or damaged incurred during shipping. 5. Should complete payment within 48 hours upon receiving confirmation email from us. 6. Items do not include postage fees. Shipping charges for deliver charges via Post Laju. * extra RM 2 for additional items. 7. Payments to be made to Maybank account. Our account number will be given via e-mail after you make your order. Step 1: Browse through our items. Step 2: Email us at mamababy_collection@yahoo.com. Please include your details. Step 3: Wait for our reply via email on payment method & delivery charges. Step 4: Make payment to us. Step 5: Please send us a notification after payment done. By sending an email to mamababy_collection@yahoo.com. Step 6: Estimated to arrive in 1 - 3 days. For any enquiries, please email us. Please scroll down for the 'ORDER FORM'. If you have any enquiries, you are welcome to fill up the form too. Thank you!